Ice shelves are floating platforms of ice fed by mountain glaciers and ice sheets flowing from the land onto the ocean. The ice flows from the grounding line where it becomes floating to the seaward front, where icebergs calve. For a typical glacier when the climate warms the glacier merely retreats, reducing its low elevation, high melting area by increasing its mean elevation. An ice shelf is nearly flat and cannot retreat in this fashion. Ice shelves cannot persist unless the entire ice shelf is an accumulation zone, where snowpack does not completely melt even in the summer. Ice shelves have long been recognized as keys in buttressing Antarctic Ice Sheets. In turn ice shelves rely on pinning points for buttressing. The pinning point are where the floating ice shelf meets solid ground, either at lateral margins or a subglacial rise meets the bottom of the ice shelf causing an ice rise on the shelf surface. The recent collapse of Wordie Ice Shelf, Mueller Ice Shelf, Jones Ice Shelf, Larsen-A and Larsen-B Ice Shelf on the Antarctic Peninsula has made us aware of how dynamic ice shelve systems are. After their loss the reduced buttressing of feeder glaciers has allowed the expected speed-up of inland ice masses after shelf ice break-up. (Rignot and others, 2004). Several recent papers examine the causes of breakup of both Larsen B and Wilkins Ice Shelf, which prompts a closer look at the role of surface melting, structural weakness development and ice shelf thinning in this process. In 1995 a substantial section of the northern Larsen Ice Shelf broke up in a few days. This was the first glimpse at a rapid ice shelf collapse. The breakup followed a period of warming and ice shelf front retreat, prompting (Rott and others, 1996) to observe that “after an ice shelf retreats beyond a critical limit, it may collapse rapidly as a result of perturbated mass balance”. During the austral summer of 2001/02, melting at the surface of Larsen Ice Shelf in the Antarctic Peninsula was three times in excess of the mean. This exceptional melt event was followed by the collapse of Larsen B Ice Shelf, during which 3,200 km2 of ice shelf surface was lost. That meltwater was playing a key role in collapse was underscored by the unusual number of melt ponds that existed that summer and that the new ice front after collapse close to the limit of surface meltponds seen in images leading up to the March event (Scambos and others, 2003). The ice shelves actually collapse via rapid calving, and the physics connecting meltwater to calving is its ability to enhance crevasse propagation. When filled 90% or more with meltwater a sufficiently deep crevasse can overcome the overburden pressure that tends to close the crevasse at depth (Scambos and others, 2000). Days before the final Larsen break-up, it is evident that the crevasses cut through the entire ice shelf. It also appeared that large meltponds contracted indicating that they were beginning to drain though the crevasses to the sea (Scambos and others, 2003). As scientists it would have been easy to close the book on the issue after identifying the meltwater process. However, detailed examinations have continued identifying other key elements in the tale of collapse. The decade prior to collapse the Larsen-B Ice Shelf had thinned primarily by melting of the ice shelf bottom by 18 m (Shepard and others, 2003). This preconditions the ice shelf to failure by weakening its connection to pinning points as the shelf becomes more buoyant. This goes back to the critical limit mentioned by Rott (1996). Glasser and Scambos (2008) reexamined the Larsen Ice Shelf breakup for structural weaknesses and observed the following. They noted that the rifting and crevasses parallel to the ice front crosscut the meltwater channels and ponds, hence, post dating them. The number and length of the rifts increased markedly in the year before collapse. Substantial rifts also existed between tributary glaciers feeding the ice shelf as far as 40 km behind the ice front. Enlargement of and development of new rifts in these regions occurred in the year prior to collapse. Downstream of the tributary glacier junction there are no evidence of relict rifts, illustrating that these rifts are a feature of the last 20 years. After ice shelf collapse the ice front receded to the pre-existing rifts, and the pre-existing rifts defined the area of collapse. In this case the structural weaknesses preconditioned the ice to rapid breakup. Rift formation occurred in areas of velocity differences and natural weaknesses Velocity differences are largest between tributaries and near the ice front. The latest example of a collapsing ice shelf is Wilkins Ice Shelf (WIS), which lost 425 km2 in late February and early March 2008. The dynamic nature of the WIS is examined by Braun, Humbert and Moll (2008), their findings are summarized below. WIS is buttressed by Alexander, Latady, Charcot and Rothschild Island and by numerous small ice rises, indicating subglacial contact. Recent history indicates that WIS experiences no continuous ordinary calving, but single break-up events of various magnitudes. They further show that drainage of melt ponds into crevasses were of no relevance for the break-up at WIS. On WIS the evolution of failure zones is associated with ice rises. Analysis of rifting indicated that in 1990 the central area of WIS did not have any substantial rifts. In 1993/94, rift formation started to expand at the northern ice front. Today, the central part of WIS is intersected by long rifts that formed in and around ice rises. The rifts can cover tens of kilometers. The evolution and coalescing of the rifts are followed by break-up events at the ice front. Hence, the connection of rift systems seems to be the trigger for collapse. 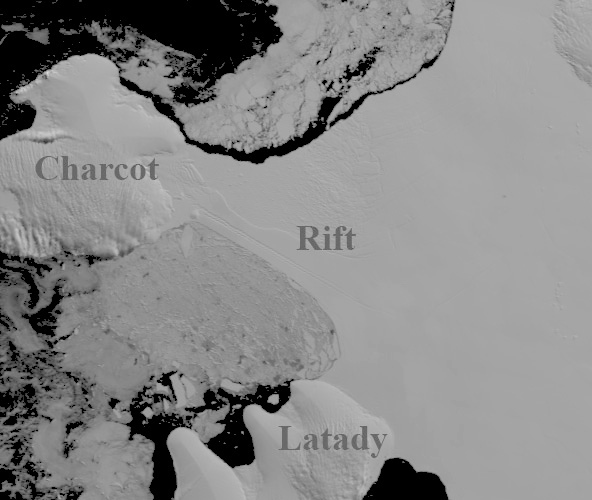 The recent break-up has left a narrow 6 km wide; already fractured connection to Charcot Island in a sensitive area that is stabilizing the northern part of the ice shelf. A new rift connection formed between already existing fractures, crosses almost the entire northern shelf, which makes WIS even more fragile and vulnerable. This area of interconnected rifts is 2100 km2. An additional 3000 km2 of the 13 000km2 of WIS, is at risk if this connection to Charcot Island is lost as rifts around the Petrie Ice Rise indicate an area of weakness. The conclusion for WIS is pre-conditioning of the ice shelf by failure zones occurring at ice rises and triggered by break-up events are leading to a sequence cascade of failure. Below you can see the evident rifts near Charcot Island in this March MODIS image and the narrow connection of the ice shelf to this pinning point. The lack of sea ice on the north facing ice front is also noteworthy. It appears that ice shelf thinning is the key pre-conditioning factor for collapse. The mechanisms for ice shelf thinning include basal melting, meltwater production and rift development. These are interrelated mechanisms that pre-condition the ice shelves to collapse. This will be a key area of continued investigation to understand this critical process for the Antarctic Ice Sheet. At the moment it seems that the key process to rapid calving events is the rift development. Rift development is observed to begin at points of natural weakness. For both ice shelves prior to collapse an expansion of the area where rifts exists has been observed. In both cases this seems to result from pre-conditioning via thinning due to basal melt and surface melt. Rifts development is accentuated by water filling crevasses. A new study will be looking at the impact of reduced sea ice at the front as well (Scambos and Massom, 2008). It is obvious that the glaciologic community will be watching the Wilkins Ice Shelf next Austral summer. Rignot, E., Casassa, G., Gogineni, P., Krabill, W., Rivera, A., and Thomas, R. (2004). Accelerated ice discharge from the Antarctic Peninsula following the collapse of Larsen B Ice Shelf. Geophysical Research Letters 31: L18401, doi:10.1029/2004GL020697. Scambos, T., Hulbe, C., Fahnestock, M. and Bohlander, J. (2000). The link between climate warming and break-up of ice shelves in the Antarctic Peninsula. Journal of Glaciology 46: 516–530. Scambos, T., C. Hulbe, and M. Fahnestock (2003). Climate-induced ice shelf disintegration in the Antarctic Peninsula. In: Domack, E., Leventer, A. Burnett, A., R. Bindschadler, R., P.
Vaughan, D. G., Marshall, G. J., Connolley, W.M., Parkinson, C., Mulvaney, R., D., Hodgson, D.A., King, J.C., Pudsey, C.J. and Turner, J. (2003). Recent rapid regional climate warming on the Antarctic Peninsula. Climate Change 60: 243-274, 2003. Is it possible to to estimate a probability density function of the likelihood of the west antarctic ice shelf melting as a function of global temperature increase from climate change? Is it possible to do the same thing for Greenland? I suspect that this would have a significant impact on the expected social cost of carbon. Humankind is surely experiencing the fulfillment of a Chinese proverb: “We live in interesting times.” Many of our brilliant scientists report that God is a delusion. On the other hand, intuitive and gifted believers regularly tell us that these scientists themselves suffer from a form of delusional atheism. No one knows, I suppose, which of these groups is correct. I am one of those people who believes the family of humanity can use God’s gift of science to take the measure of any global challenge and find solutions that are consonant with universal values. But, before we can move forward to reasonably address and sensibly overcome a challenge to human wellbeing and environmental health such as global warming, that challenge needs to be openly acknowledged and widely discussed. I suppose it is a function of my life experience to suggest that we accurately “diagnose” whatever the challenge is before proceeding to implement “treatment” options. If great spiritual and scientific leaders are somehow on the right track when realizing, “The Earth has a human-induced fever and could overheat,” then at least one available treatment option is to carefully and skillfully examine the extant scientific evidence related to global warming and to make necessary changes in human behavior, both individually and collectively. I am completely uninterested in how the ice breaks up when melting. Much more important is how much heat is being absorbed when this ice changes to water. Any glacial experts out there care to total up this energy absorbed (terawatts/year) and relate it to what the earths’ temp. would be without this cooling provided by melting ice? less ice means more rapid warming of permafrost than GCMs are projecting. Anybody surprised? I am curious about the relationship between Antarctic sea ice and ice shelves. There has been a recent increase in sea ice. What is causing the increase? And will it help stabilize the ice shelves? By studying chemical changes in deep sea sediments, scientists at the University of California, Santa Barbara discovered that high-latitude Southern Ocean cooling helped to trigger this major expansion of Antarctic ice sheets, which have since become a permanent feature of the global climate system. These results document ice sheet history and supply crucial insight into the dynamics of the global climate system. . .
Southern Ocean temperature data exhibits a rapid 7 degree cooling of surface waters around 14 million years ago and suggests a strengthening of the Antarctic Circumpolar Current in response to changes in the geometry of Earth’s orbits. As a result, Antarctica became increasingly isolated from tropical heat and moisture sources. Records of Antarctic ice volume indicate that following this cooling ice sheets expanded rapidly to near present-day size, which suggests that changes in the Southern Ocean directly influence the size of the Antarctic ice sheet. If you want to see some ridiculous coverage of this issue, check out Pielke Sr.’s March 27 2008 post. Their choice of references? ICECAP, the latest version of fossil fuel investor-funder anti-science PR. Is there some global climate model that predicts anything like that occuring? Thanx for the column. I was just reading the paper by Wiens et al.,”Simultaenous teleseismic and geodetic observations of the stick-slip motion of an Antarctic ice stream”, Nature, v453, p770, 5 June 2008. I recall that similar icequakes have been recorded in NE Greenland, and I was wondering if there had been similar studies there (or elsewhere). There was another nice recent paper about a set of interconnected subglacial Antarctic lakes filling and draining within days, but i do not remember that any seismic signature was recorded. Another question occurred to me: from the Wiens paper, the total ice moved into the Ross ice shelf by a single ice stream seems to be on the order of several 1000 km^3/yr. The estimate from GRAVIS for net ice mass loss from all of WAIS is on the order of several hundred km^3. So the difference must be made up by thickening of the ice shelf and snow accumulation. But it seems that the net ice mass loss is the difference of two much larger numbers: the total snow accumulation less the total melt and calving loss. Each of these seems to be on the order of 1e5 km^3. So the net mass loss is on the order of 1% of total snow accumulation or total mass loss. Does this not indicate that even a 1% increase in melting/calving rate will double net mass loss ? On a related note: do any ice sheet models predict increase in sea ice as the ice shelves collapse and float away ? I’ve also been looking for an answer to this question. In the GISS land-ocean temperature data (http://data.giss.nasa.gov/gistemp/tabledata/GLB.Ts+dSST.txt) the first quarter of 2008 was the coolest since 4Q 2000. Is it reasonable to look for a relationship between this cool trough and the recent Wilkins Ice Shelf event? There’s an entanglement between this technical issue and the subject of human perceptions: if ice-sheet failure can be expected to postpone effects of climate-change (such as temperature rise), how long will this reprieve last, and how will it affect our response? An example of such entanglement can be seen just above, in posts 6 and 7. It can be a mistake to rely on common sense where complex systems are involved, but it seems natural to expect that when ice-sheets break up, the former sheet-ice becomes sea-ice (for a few months, anyhow). Where else would it go? Many comments have noted the sea ice extent and its role. The sea ice itself has not too date been identified as a factor in ice shelf breakup, in general the ice sheves see little open water at their front. The potential problem would be increased wave action at the ice shelf front. At this point it would be pure conjecture to consider its impact. That is the point of the upcoming study proposed by Scambos and Massom. At this point it is hard to anticipate an impact on the larger ice shelves such as the Ross Ice Shelf, but on the thinner ice shelves on the Peninsula it could be a final straw that helps accentuate the near ice front rifting. #2 I am sure you are correct, that the article could you use more proof reading, not my strongest suit. The mechanims noted basal melt, surface melt and rifting are not unrelated nor inconsistent. They clearly work in concert, the question is the details behind the relationships. In the case of WIS there seems to be less of a role of surface melt. The rifting does require some thinning mechasism to pre-condition to prime the ice shelf for rifting. #4 The role in the earth’s heat budget of the breakup of the ice shelves, I do not know. It is definetly of much less importance than the potential for ice shelf breakup and consequence for accelerating feeder glaciers to raise sea level. You should care as much about the ice shelves as any aspect of global warming. The link to the University of Texas’s (Austin) Secrets of the West Antarctic Ice Sheet is still good. This symposium can be viewed on the web. The British Antarctic Survey does a presentation that discusses the role of increased current velocity on the melting of ice shelf bases. They note that it is increased wind speed, driving ocean currents that are causing the increase in shelf base melt. I guess that the wind increase is a result of the ozone hole versus global warming. But, global warming should more than take up the slack as the hole begins to close in 30 or so years. I enjoy your grammar as it reminds me fondly of my father in law’s speech (Peruvian). What you should really be asking, given that sea ice coverage has been growing globally, is how much cooler the global temperatures would be without this effect of latent heat being introduced into the environment as H2O moves to a more ordered state ie ice. May we conclude that possibly the Arctic could be free of shelves and platforms this summer? I heard the year 2013 predicted. And surely that does not mean floating ice free, but rather just sheets and platforms of a certain size. How will that remaining ice be counted? Are you talking about sea ice extent or sea ice thickness? More interestingly, what might be some of the features that caused climate models to miss the rapid retreat of Arctic sea ice? Why would total SH sea ice not be significant amongst other trends? Would not sea ice be a measure of global warming which would lead to increased sea levels? If the SH sea ice is growing, one would presume temps are colder or below freezing for a longer period of time, thus reducing melting and increases in sea levels. Also, considering the recent increases in global temps, why wouldn’t record winter 07 SH sea ice, followed by winter 08 SH on record pace, not be noteworthy? Is it because it runs against consensus? Clearly there is some importance behind SH sea ice and last year’s record and this years pace. If the Arctic goes rapidly (I think it will), then much of the projection and impacts work of the IPCC becomes irrelevant. Which is not a good thing. Not necessarily. The Arctic has historically experienced more extremes than the rest of the planet. Even if the sea ice reaches another record low, that doesn’t necessarily mean global warming is exceeding the IPCC projections…note that the extremely low Arctic sea ice of last fall still led into one of the colder northern hemisphere winters in recent memory. So the weather at the poles does not necessarily indicate global weather trends. I don’t think Gavin meant “significant” in the sense of “important” or “meaningful,” but rather in the sense of “statistically significant,” i.e., distinguishable from random noise. However, the change in southern hemisphere sea ice extent is statistically significant — just barely. This is mainly due to the high values so far in the 1st half of 2008; if they persist, the trend will remain significant but if they don’t the trend will probably not remain significant. Using data from late 1987 (the beginning of satellite observations) through May 2008, SH sea ice extent shows a positive trend rate of +12,000 km^2/yr. NH sea ice extent currently shows a negative trend rate of -131,000 km^2/yr. Why would total SH sea ice not be significant amongst other trends? Insert the word STATISTICALLY before the word SIGNIFICANT in Gavin’s comment. He’s assuming that readers know what “significant” means when speaking of trends. Clearly there is some importance behind SH sea ice and last year’s record and this years pace. Last year’s Arctic drop was 25%, that’s together with a whole range of observations that show a substantial change in the Arctic that outweighs the significance of the Antarctic sea-ice changes. In terms of sea ice they are very diferent issue; nobody is seriously talking about losing the Antarctic Ice Cap within a decade. I’m intrigued by Ike’s post (currently #7). An increase in the westerlies that circle the globe around Antarctica is a pretty robust projection in most models (IIRC), and has already been observed, at least to some extent. Those westerlies help to drive the circumpolar current, so as they intensify, we should see the current become stronger. The wind belts are also projected to move towards higher latitudes. The paper that Ike quotes from suggests that this may have been the mechanism for rapid glaciation 14 million years ago. If that is true, then there is the possibility that as warming progresses there might be further Antarctic cooling (irrespective of ozone recovery). I suppose there’s also the possibility that increased storminess around the fringes of Antarctica could provide a mechanism to get moisture into the interior, and thus grow more ice. Floodguy, what Gavin probably means is that the recent SH sea ice extent variations are not statistically significant, unlike Arctic sea ice. Remember that sea ice is frozen sea water floating on the ocean, hence its melting does not affect sea level like accelerated flow/melt of ice sheets. I think the point here is that sea ice volume is a the critical measure, which is a function of both thickness and extent. In the Arctic, sea ice thinning preceded the loss of summer sea ice by decades. In the Antarctic, due to a lack of historical data (it seems unlikely that U.S. submarines would have collected datasets on Antarctic sea ice thinning – but maybe? ), we don’t know what the sea ice thickness trend is. The pattern so far is that thinning sea ice results in an ice pack that is far more sensitive to wind and current forcing than a thicker ice pack. Yet we simply have no idea of what the thickness trend in Antartic sea ice is. Using sea ice extent to predict future trends is nonsensical – If you had looked at Arctic sea ice extent up to 2005, you would have not predicted the sudden summertime collapse, right? The real topic here, however, is how fast mass will be lost from the West Antarctice Ice Sheet. If we get accelerated ice loss from Greenland and the WAIS, that would mean that IPCC predictions of 21st century sea level rise are underestimates. Let’s remember that all icebergs come from the calving of ice shelves or the calving of glaciers at the coast. If someone could show the number of icebergs has increased recently, then one could show the break-up of ice-shelves is unusual in an historical context. Floodguy, you seem to be having trouble parsing the sentence. OK first find the subject: SH trends. This means that the way things are changing, and since this is “realclimate” and not “realweather”, a trend is of order decades. Now let’s find the verb–there it is: are. And it is negated by the “not” and then we have the predicate: significant. So basically, what tat means is that you have a couple of years, and that’s weather. Hence THE TREND is not significant. That help? You can do the math on the effect of latent heat. It takes 333.55 kJ/kg to melt water, so 1 cubic km of water takes about 3 x 10^17 joules to melt. Given the difference in albedo between ice and water, this will be made up in about 5 years due to increased solar absorption once the ice is gone. Monaghan, A. J., D. H. Bromwich, W. Chapman, and J. C. Comiso (2008), Recent variability and trends of Antarctic near-surface temperature, Journal of Geophysical Research, 113, D04105, doi:10.1029/2007JD009094. Mackintosh, A., White, D., Fink, D., Gore, D.B., Pickard, J. and Fanning, P.C. 2007. Exposure ages from mountain dipsticks in Mac. Robertson Land, East Antarctica, indicate little change in ice-sheet thickness since the Last Glacial Maximum. Geology 35: 551-554. The mass of Antarctica’s grounded ice sheet has been steadily growing over the past quarter-century. Van de Berg, W.J., van den Broeke, M.R., Reijmer, C.H. and van Meijgaard, E. 2006. Reassessment of the Antarctic surface mass balance using calibrated output of a regional atmospheric climate model. Journal of Geophysical Research 111: 10.1029/2005JD006495. 44.1% greater ice extent and 30% greater ice concentration in January 2008 compared to 1980. If there are significant calving events over several years then surely we must expect the extent of sea ice to increase by a sort of ice-cube in your drink effect. The surrounding ocean will lose heat to the melting of the shelves and so be more prone to seasonal freezing. Could the meltwater/crevasse phenomenon affect glaciers as well? If so, and meltwater eats through the bottom of glacial crevasses to reach ground level, could this lead to the feared effect of glaciers becoming much more lubricated and moving into the sea significantly faster? Here’s the link to the Secrets of the West Antarctic Ice Sheet panel discussion. I’d forget my head if it weren’t attached. http://www.esi.utexas.edu/walse/ The British Antarctic Survey presentation discusses the hypothesis that increased wind speed and thus increased currents are raising air and water temperatures on and under the ice shelves. Gavin – Floodguy’s questions about SH ice would sure seem relevant to global conditions. Are you suggesting that the SH anomaly is statistically insignificant or climatologically insignificant or both? Is “Cryosphere today” http://arctic.atmos.uiuc.edu/cryosphere/ a good source of scientific information ? The time of year right now is at the precipice of last years massive anomaly : http://arctic.atmos.uiuc.edu/cryosphere/IMAGES/current.365.jpg. Do people think this was just a bad year or will there be an even deeper anomaly this year as all that single year ice is rapidly melted, before multiyear ice manages to slow the melt. Looking at the anomaly in 2006, it looks like the anomaly in 2007 starts from where the 2006 anomaly left off. If that is what happens I think we can expect to quickly get back to -3 million square km and then reach a minimum of around -4 million square km (or a remaining ice area of 2 million km) this year. Is there any more thorough analysis of this data to predict the coming year or do we have to wait till the data becomes statistically significant by which time there will likely be 0 square kilometers of ice summer. – Looking at the anomaly graphs posted in  by CobblyWorlds, it is clear that 1980 was a fluke negative outlier. Using it as a comparison for the 2008 positive spike is misleading. You should compare to a longer period mean. When you do so the difference between the two poles is clearly apparent. There is a very consistent negative trend in NH sea ice, which is accelerating. SH sea ice is mostly stable, with much greater noise and some recent positive spikes. The difference in no way undermines the Arctic signal as an important sign of global warming happening now. It is an odd phenomenon a discussion starts on ice shelves, and yet sea ice becomes the topic, hmmmmm. There seems to be several point of confusion. First a numberof posts indicate that the impact on the energy balance of the region would be impacted by the WIS breakup. Well no, compare the volume of ice involved to the the volume of ice that comprises the sea ice or even the ice on a large lake like Lake Erie in the winter, and you will be reminded that ice melt has a limited role in cooling already cold water or in cooling the air overhead. Second the amount of icebergs by areal extent compared to the Antarctic sea ice is tiny and is not an important contribution to the formation of further sea ice or to the overall heat balance of the system. The sea ice in the southern hemisphere also lacks the potential impact of the ice sheet. The role of meltwater in crevasse formation and exploitation is minor on most glaciers, however, on thin sections of ice shelves, the post notes that it does have a role, a thermal role. It is a role that was observed on the Larsen, but not on the WIS. The purpose of the post it to illustrate that it is beginning to appear that meltwater was not the key to the breakup of these ice shelves, but did have a significant pre conditioning role. The main pre-conditioner is rifting which is more robust when the ice shelf becomes thinner. Tamino has posted a rather sobering (as if we needed more — where is my merlot?) description of new research showing that the permafrost in the north is on its way to meltdown with attendant consequences. Joeduck–A couple of years worth of data is “weather” not climate. You just can’t hope to wrest signal from noise for such a short period of time. Remember, what we’re talking about here is “GLOBAL CLIMATE CHANGE”. It is important to understand what all three of those words imply. Am I guilty of another “insignificant” misreading wrt your “heat budget”? Surely the breakup of the ice shelves is due to anthropogenic global warming? On what reserach, published studies, etc.do you base that comment. Fact is, we do not know the impact of a massive dark surface at the Arctic Ocean on the convective currents, percip and temp of western NA. The world population and Archer Daniel Midland et.al. depend upon climate stability in Western NA; some for survival and others for profit (i.e., ethanol). If you have insights we do not yet have, please share them. The reasons for the ice sheet breaking of is due to tectonic activity along the Antarctic Peninsula. Undersea volcanic activity is warming that part of the oceans. That’s where the volcanic activity is happening along the plate boundary. The melting ice sheet there has nothing to do with global warming. I ask the question again, how many things that do not support AGW must happen before you at RC give up AGW? What is needed to falsify the theory? #19 thank you Tamino and others for the replies. On a different note, do you foresee any affect to NH ice from a negative PDO, if the PDO has indeed turned negative? Joeduck, see Gavin’s inline response to #19, and Tamino’s postings. “Barely significant statistically” — and it’s the two-dimensional area is what’s watched there. Reports of melting from underneath are discussed above. Get a lot of fresh water released from melting underneath, it rises above the denser salt water — and perhaps some of that freezes again around the edges during the winter as the air’s cold? I’d speculate that’s happening. People on the spot will find out. A model study has been conducted of the unprecedented retreat of arctic sea ice in the summer of 2007. It is found that preconditioning, anomalous winds, and ice-albedo feedback are mainly responsible for the retreat. Arctic sea ice in 2007 was preconditioned to radical changes after years of shrinking and thinning in a warm climate. During summer 2007 atmospheric changes strengthened the transpolar drift of sea ice, causing more ice to move out of the Pacific sector and the central Arctic Ocean where the reduction in ice thickness due to ice advection is up to 1.5 m more than usual. Some of the ice exited Fram Strait and some piled up in part of the Canada Basin and along the coast of northern Greenland, leaving behind an unusually large area of thin ice and open water. Thin ice and open water allow more surface solar heating because of a much reduced surface albedo, leading to amplified ice melting. The Arctic Ocean lost additional 10% of its total ice mass in which 70% is due directly to the amplified melting and 30% to the unusual ice advection, causing the unprecedented ice retreat. Arctic sea ice has entered a state of being particularly vulnerable to anomalous atmospheric forcing. The surface air temperature (SAT) over the Arctic Ocean in reanalyses and global climate model simulations was assessed using the International Arctic Buoy Programme/Polar Exchange at the Sea Surface (IABP/POLES) observations for the period 1979–1999. The reanalyses, including the National Centers for Environmental Prediction Reanalysis II (NCEP2) and European Centre for Medium-Range Weather Forecast 40-year Reanalysis (ERA40), show encouraging agreement with the IABP/POLES observations, although some spatiotemporal discrepancies are noteworthy. The reanalyses have warm annual mean biases and underestimate the observed interannual SAT variability in summer. Additionally, NCEP2 shows an excessive warming trend. Most model simulations (coordinated by the International Panel on Climate Change for its Fourth Assessment Report) reproduce the annual mean, seasonal cycle, and trend of the observed SAT reasonably well, particularly the multi-model ensemble mean. However, large discrepancies are found. Some models have the annual mean SAT biases far exceeding the standard deviation of the observed interannul SAT variability and the across-model standard deviation. Spatially, the largest inter-model variance of the annual mean SAT is found over the North Pole, Greenland Sea, Barents Sea and Baffin Bay. Seasonally, a large spread of the simulated SAT among the models is found in winter. The models show interannual variability and decadal trend of various amplitudes, and can not capture the observed dominant SAT mode variability and cooling trend in winter. Further discussions of the possible attributions to the identified SAT errors for some models suggest that the model’s performance in the sea ice simulation is an important factor. Richard Wakefield, Want to falsify the hypothesis that humans are behind the current warming epoch? All you have to do is come up with a physical, dynamical model that does as good a job or better of explaining all the trends and doesn’t include an increased greenhouse effect. Of course, then you have to explain why the greenhouse effect should magically stop when CO2 concentration goes above 280 ppmv, but one thing at a time. Go ahead. We’ll wait. Volcanoes, Richard? Do they also explain the meltdown of the entire Arctic? Here’s a working link to the animation from ESA, starting with 5/30 and day by day showing the breakup as far as it’s gone. The press release says further cracks in the shelf indicate the breakup is continuing. Mauri, Thanks for a great summary. A couple of points. Although ice shelf thinning does indeed appear to precede ice most ice shelf break-ups, no model has been forwarded yet that connects this thinning to the rapid disintegration process we see in the Larsen A, Larsen B, and Wilkins (and several icebergs in late stages of decay; Scambos et al., 2005 GRL). One possible link, however, is that reduced ice thickness leads to reduced connection with pinning points on the flanks of the shelf, and therefore lower internal compressive stress (or lower net tensional stress, to be accurate). Braun, Humbert, and Moll have done an excellent job characterizing the history of change in the Wilkins Shelf, and have detailed how changes in its perimeter (small break-up events) had a near-immediate effect on internal rifting. However, they make one point that I think will be widely mis-interpreted (and I think they are mis-interpreting it themselves): that surface melt ponding had nothing to do with the recent Wilkins break-up event of March, 2008. That is, sensu stricto, true: the only observed surface ponds in the Wilkins are on the northeastern corner of the shelf, well away from the break-up area. But the Wilkins is known to have an intense melt season, and has been observed to have water-saturated firn. This water-saturated condition may be sufficient to drive the hydro-fracture model we describe (Scambos, Hulbe, Fahnestock, 2003; and, of course, it’s based on early related ideas by Weertman and Robin). Note that all the ‘disintegration’ events occur in late summer, at the end of large melt seasons. The Larsen A broke up in late January, 1995; the Larsen B in March, 2007, and the Wilkins in March 2008. This seasonality continues to point to surface melting as the key cause of ice shelf break-up.